The first Pink Floyd album not to feature founder and bassist Roger Waters, A Momentary Lapse of Reason represented a definite transition to a new phase in the band’s long history. It came in the midst of a tumultuous period of lawsuits and name-calling between Waters and his former band mates, led by vocalist and guitarist David Gilmour. Waters officially left the band in December 1985 and tried to officially “dissolve” the Pink Floyd name with his departure, but Gilmour and drummer Nick Mason wanted to continue with new projects by the then-two-decades-old band. Later in the A Momentary Lapse of Reason sessions, former band keyboardist Richard Wright was brought on to give the album “more legitimacy” as a Pink Floyd album (although Wright was not re-instated as an official band member until later). After the band’s previous release of The Final Cut in 1983, Waters, Gilmour, and Mason each composed solo albums, with Waters and Gilmour following up with respective solo tours. It was during Waters’ 1985 tour for The Pros and Cons of Hitchhiking that Mason approached him about his desire to continue with a new Pink Floyd project. However, Waters had already decided to break up the group and was not swayed even after Gilmour threatened to continue without him. 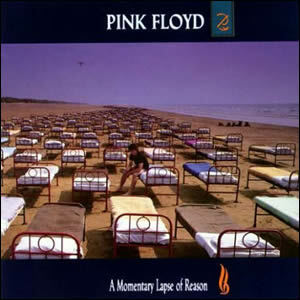 Lawsuits ensued over the use of the Pink Floyd name, images, and the performance of certain songs, which were not settled until late 1987, after the release of A Momentary Lapse of Reason. The album’s music originated from sessions for a new Gilmour solo album in 1985, which were recorded primarily on Gilmour’s converted houseboat, called Astoria, anchored on the River Thames. Gilmour changed his mind in 1986 and decided to use the material for a new Pink Floyd album when Mason joined the project. Bob Ezrin, who co-produced the band’s 1979 blockbuster The Wall, was brought on to produce shortly after he had turned down a similar offer from Waters to produce his new solo album, Radio K.A.O.S., which added further fuel to the feud. Ezrin used new digital technologies, MIDI synchronization, and drum machines throughout the album, a significant change from the more traditionally recorded previous Floyd albums. There is no doubt that part of the “Pink Floydization” of the album was to nod back to previous song names, themes, and structures. This is evident in the song titles “A New Machine” (a song “Welcome To the Machine” appeared on 1975’s Wish You Were Here and “Dogs of War”, which is a quasi-sequel to the Roger Waters Animals track “Dogs”. Co-written by Anthony Moore, “Dogs of War” suggests the silent hand behind all war is money, describing political mercenaries in particular. Mason played a big role in the opening track, “Signs of Life”, by adding some synthesized effects and spoken word in the background. It sets the houseboat scene beautifully with the underlying sound of a boat rowing down a calm river, which was an actual recording of Gilmour’s boatman rowing across the Thames. The result is a cross between the early Pink Floyd experimental sound collages like “Speak to Me”, and the mood-setting long intro to “Shine On You Crazy Diamond”. “Signs of Life” serves to set up the listener for the sudden and sharp contrast of “Learning To Fly”, where the rock n roll portion of the album really begins. Perhaps better than any other recording, “Learning to Fly” has the absolute perfect mechanical sound, built to perfection during the verse rhythm by Ezrin, who co-wrote the song along with Gilmour, Moore, and Jon Carin. The theme was inspired by Gilmour’s passion for flying, as he is a licensed pilot, but also symbolizes his new role as the undisputed leader of the band after Waters’ departure. The song put Pink Floyd back on the radio as well as music television for the first time with a professional music video, and reached #1 on the Billboard album rock tracks chart. The album’s first side wraps up with a couple of radio-friendly, pop-influenced songs, something very rare on previous Pink Floyd albums. “One Slip” contains a synthesized arpeggio in similar style to some tracks on The Wall. Co-written by Roxy Music guitarist Phil Manzanera, the lyrics describe a one-night love affair (another rare theme for Floyd), with the chorus hook providing the title for this album. “On the Turning Away” is another #1 album rock tracks song, with lyrics that explore deeper issues of poverty and oppression, and the tendency of people to forget about those afflicted by such conditions. Musically, the song starts of very calm and ballad-like but transitions to sections of extended biting and wailing signature guitar leads by Gilmour. The album’s second side contains much less rich songcraft and much more ethereal soundscape and experimental tracks, harkening back to the band’s mid-era prior to Dark Side Of the Moon. These include a mixture of instrumentals and non-traditional sounding pieces, including “Yet Another Movie”, which features some dialogue lifted from the classic film Casablanca. The electrically distorted, noise-gate and vocoder dominated “A New Machine” bookends the smooth-jazz-like instrumental of “Terminal Frost”, which features dueling saxophones by Tom Scott and John Helliwell, the latter of Supertramp fame. The album’s closer, “Sorrow”, contains an opening guitar piece by Gilmour which was recorded live in a large, empty arena, with the sound piped through the public address system. The rest of the song diverges, with a steady beat and electronic effects providing a backdrop for the slicker lead guitars and calm vocals. After the release, of A Momentary Lapse of Reason, Roger Waters derided his old bandmates’ material on this album as “third rate”. A bit of a rivalry ensued through the subsequent year when both acts toured and sometimes ended up in the same city at the same time. Waters continued his fight on this front by threatening to sue several promoters if they used the Pink Floyd name. In the end, the overwhelming fan response to the Pink Floyd tour, which sold out several large stadiums, re-established the new, truncated lineup of this long established band as an entity, which would carry on for several more years. I think of this album as a “Necessary Lapse of Band Participation.” Had we lost the Floyd after Final Cut, the legacy of the band would have fizzled, I think. Sure, Gilmour was a much a driver of aMLoR as Waters was of FC, but it wasn’t that he was trying to force his own vision into the PF container for egoistic reasons. Gilmour needed the Floyd – let’s be clear. His solo tours were no more successful than Waters’ would turn out to be (other than the Wall presentations, of course). But he was committed to a larger Floyd vision and it seems to me that his construction of the album with Ezrin and the carnival of supporters was designed to INCLUDE Mason and Wright. (I still haven’t come across any real detailed descriptions of Mason’s contributions to the album’s productions. It’s clear he was around and provided support. Did he review the recordings and make artistic decisions? One would think so.) While the album itself is not a “band” album, the two years of touring healed the wounds all had suffered under Waters’ final cuts. If you listen to the progress of the musical presentation over the course of those two years in available soundboards and various videos, you can hear the joy of playing together return. Sure, it’s a stadium show. There are lots of performers other than the core and it’s no longer anything like the flexible Floyd live unit of the past. Why shouldn’t Floyd grow into its shoes and take on its growing legacy by fulfilling the promise of huge live shows? Most older rock bands have done the same. Just go to a Rolling Stones concert. The point is to fill the stadium with sound and visuals to make even the most distant seat-holder feel that they’re part of the moment. As for a critical view of aMLoR, I’ll only say that I think there’s more thematically consistent going on in this album than most reviewers give Gilmour credit for. He didn’t write all the lyrics, but he was clearly involved in the entire production. It’s a dark album for the most part. Industrial Floyd and a good counterpoint to the flashier sounds produced by most bands in the 80’s even if it suffers some of those same production values. Well, it WAS produced in the 80’s, why shouldn’t it sound like that? I think it has withstood the test of time. I still listen to and love it to this day. I think Division Bell sounded much more like a Gilmour solo effort. Just listen to his stuff and you can see that aMLoR isn’t anything like the ‘collections of songs’ that Gilmour puts out on his own. Finally, A Momentary Lapse of Reason captures the essence of what Pink Floyd is about – glimpses of madness, mistrust of conventional values, missed opportunities and regret, and the persistence of hope in the face of dark forces that seem overpowering and all-controlling. It’s about our humanity and I would say that the second side of the album is as coherent and exploratory as some of the best “mid-era” Pink Floyd. Thanks for your balanced review of the album!